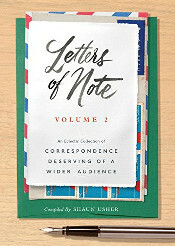 Letters of Note: Amateur comedy is too "On the nail"
Letters of Note is an attempt to gather and sort fascinating letters, postcards, telegrams, faxes, and memos. Scans/photos where possible. Fakes will be sneered at. Updated as often as possible; usually each weekday. Edited by Shaun Usher, who also runs Lists of Note & Letterheady. Many fascinating letters (currently 900 in total) can be found in the archives, here. Alternatively, below are the most popular. Amateur comedy is too "On the nail"
This meant the world to me. A man that was THAT busy at the time (doing Newsradio, The Simpsons, commercials, films, and God-knows-what-else) took the time out to not only respond to my letter, but listen to the tape I sent him. It wasn't lost on me, even at that age. Over the next year, Mike proceeded to compile a tape of fresh material and pen a follow-up letter; a progress report of sorts. It was still being written when, in May of 1998, the tragic news of Phil's murder stunned the nation. I never got to send that package. I never got to thank him. Who would have known he was going to be taken from us so early? With every piece I create I hope I make Phil proud. He was the most brilliant performer and was not just overwhelmingly beloved by his fans, but by his peers that never had a bad word to say about him. He was everywhere and still so many people don't realize just how much he was involved in. Because he was a man of so many talents, I am always finding new material with him in it, so it's not like he's really gone. Transcript follows. Images courtesy of the letter's recipient, Mike Scott, whose cartoons can be enjoyed on YouTube. Many thanks, Mike! Hi. Thanks for your letter. I listened to your tape, enough of it to hear that you have true natural talent. Your voice is pleasant to the ear. That, I think is your basic talent. Your humor is like a lot of comedy I hear today...angry, somewhat mean spirited, okay I guess if that's what makes your friends laugh. Sure. Go there. Maybe I'm old. I honestly recognize that a lot of humor (my humor, too) is hostile. But when it's too on the nail..."I can't stand Alannis, Nickelodeon, etc. "...to me, it lacks craft and subtlety. Look at Letterman. His humor is hostile. But it holds back, to network standards, and yet still works beautifully. He doesn't go all the way. You seem to be going more toward a Howard Stern sensibility, and I prefer Letterman. So there you go. "And that's OKAY," as Stuart Smalley says. I just have a sense that you could be more than a shock jock. It's just a hunch. As artists we all face the same challenge -- What is funny about me? Or, more pertinently, Who am I? If you dislike Alannis, and say so bluntly, that's not funny. If you make a TOP TEN LIST OF OTHER THINGS ALANNIS FINDS "IRONIC," that can be funny, and still allow you to express your antipathy. Amateur comedy is too "On the nail." You need to develop craft. In school, in a radio gig, a theatre group, improv troupe, or standup showcase. Don't be discouraged. You have talent. Personally, I like your own voice more than your impressions and character work. Just work, wherever you can. You'll grow and refine and be great. Be patient. (I didn't start acting till I was 27). You've got a head start. Comments are now closed on Letters of Note. Letters of Note, PO Box 322, Manchester, M21 3DL. 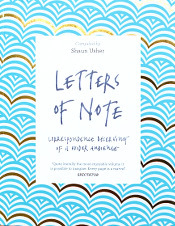 The bestselling Letters of Note books can be bought at Books of Note. Visit the Archives for hundreds more letters. Out in the U.S. on Oct 11th.